On March 21, 2018, Public Works Director Mike Ramsey received the George Warren Fuller Award from the American Water Works Association. The award was given in recognition of Mike’s commitment to the improvement of the water industry and for his long-standing dedication to and outstanding leadership in the AWWA. Mike has worked in the water profession since age 15 and has been full time with the Village of Westmont Public Works Department since 1986. He was promoted to Director in 2015. Mike is currently the chair of the MAC Committee and the Competitions Committee for AWWA and is a Class *C* and *D* Water Operations Instructor for Illinois AWWA. He is a Class *A* Certified IEPA Water Operator and one of two Association of Board Certified Water Operators. In 2013 Mike launched Hydrant Hysteria, a state-wide competition in which teams of two race to assemble a fire hydrant. In 2015 he was awarded the AWWA Gimmicks & Gadgets Award for developing the light up valve key and in 2017 he started the Model Water Tower Building Contest here in Westmont. 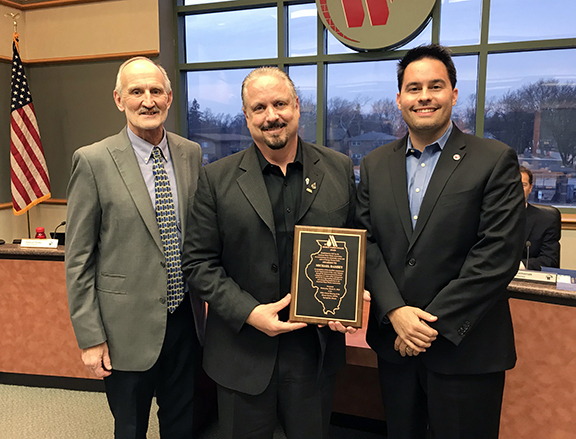 Mike was recognized as the AWWA Water Professional of the Year in 2014 and was awarded the Clifford E. Fore Award in 2017 for being the State of Illinois Water Operator of the Year. The Village of Westmont congratulates Mike on this recognition and thanks him for his dedication to excellence.